Reserved for a Select Few Seeking Recreation off the Grid without Sacrificing Comfort. Unlike the vast frozen State up north, the temperate Southeast “Panhandle” region of Alaska runs along the Northwest coastline of British Columbia, Canada and remains remarkably mild. Much of the region is included within the 17 million acre Tongass National Forest – the largest of its kind in the United States. Winters span from November through April with average temperature ranges from freezing to the low 40-degrees. The summer months boast long days with comfortable temperatures that range from the mid 40-degrees to the mid 60-degrees on average, although readings in the high 70-degrees and even low-to-mid 80-degrees are not uncommon in July and August. Known as “an island of superlatives”, Admiralty Island comprises approximately 1 million acres of old growth forest that was 300 million year in the making. This extraordinary natural sanctuary was designated a US National Monument by President Carter in 1980 and so Hidden Bay Retreat is quite literally surrounded by the Kootznoowoo Wilderness Preserve. Explore more than 700 miles of waterfront and dramatic peaks that soar up to 4,500 feet – many which still comprise pockets of ice from the last glaciation of the area. Hood Bay is a pristine ecosystem that includes a bay and two huge arms, the North Arm and South Arm, which offers impressive tidal flats for wildlife viewing and amongst the best fishing in Southeastern Alaska. Located in a protected, leeward position in Hood Bay behind the rain shadow of the Coast Mountain Range, Hidden Bay enjoys a unique “micro-climate” with three times the sunshine and a third less precipitation than Sitka and half that of Juneau. This sanctuary is so remarkable, Rufus Hummingbirds from Central America migrate thousands of miles each year to nest along its shoreline. From this perch, behold a plethora of wildlife including Brown Bear and Deer, Humpback and Killer Whales, Sea Lions, Seals, Eagles and dozens of other waterfowl population that thriving in this natural splendor. 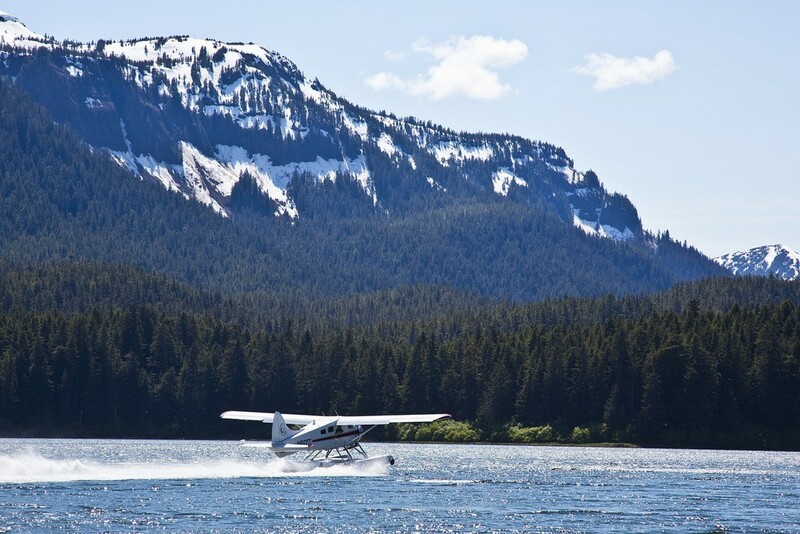 Perfectly positioned between the coastal cities of Juneau and Sitka in Alaska – Hidden Bay Retreat is just a 45-minute charter sea plane (or helicopter) commute, or approximately a 2+ hour voyage by motorboat to all residential services and conveniences (including emergency hospital dispatch). Both Juneau and Sitka host frequent commercial flights (or private aircraft) to and from major West Coast cities such as Vancouver, B.C. (1 hour, 20 minutes) or Seattle, WA. (1 hour, 45 minutes). Many visitors will set sail each summer to Southeastern Alaska through the “inside passage” between Vancouver and Juneau – regarded among yachtsman as one of the most beautiful waterways in the world.